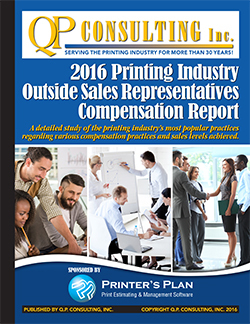 A first of its kind publication – A detailed look at compensation practices for outside sales representatives in the printing industry. Based upon the feedback and participation of almost 150 firms, this 75+ page study details the sales generated and the commissions and bonuses received for firms ranging in annual sales from less than $500,000 to firms with sales of $15 million! If you already employ an outside sales representative you can compare the performance of your sales representative against firms reporting similar annual sales, profitability and productivity as measured by sales per employee. One printer who asked us not to use his name or location because of competition, rated this study as "excellent" as to the value to his business and told us he was definitely making changes as a result of the information revealed in this report. "Thank you - I've always wanted this type of information. I've been missing a lot of $$ plus control over this segment of my business, resulting in a lot of stress. Thank you." If you’re thinking about hiring a sales representative, especially for the first time, this study will prove to be a real “eye-opener” as to what you can expect to pay an experienced outside sales rep. and what you should expect that person to produce in return! The study is available as either a hard copy or a PDF. Participants received their “complimentary” copies on March 21, 2016. Prices include S&H. Orders for hard copies are shipped within 24 hours, and PDFs are normally transmitted within 8 hours. on a 100% Money-Back Guarantee Basis.